After having peaked in popularity in the 1980s, record players have returned to the modern music scene. With models of varying designs and features, there are currently a plethora of turntables available for sale. 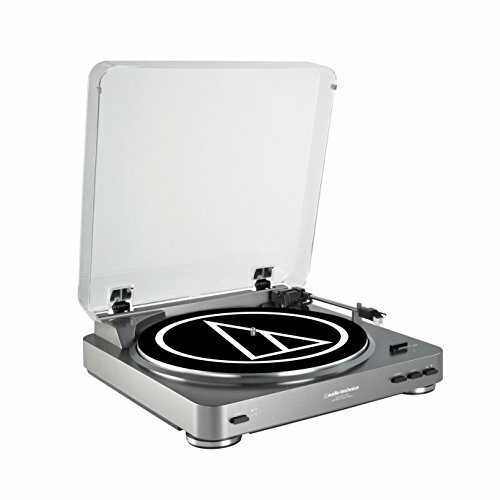 Audio-Technica is a manufacturer of some of the best record players on the market today. Having gotten their start with the production of stereo phonograph cartridges, Audio-Technica boasts over 50 years of experience producing top-quality audio equipment. Some of this company’s products have even been utilized in official government buildings, selected over other competitors for their outstanding reliability. This record player review will cover the AT-LP60-USB, a highly rated and progressive product for the modern music lover. With the vast range of details and factors found in the record player market today, it is important to know some basic criteria in order to make the right choice for purchase. One characteristic to look at is the turntable’s operation type. Currently, record players use either a belt-drive, direct-drive, or digital system. Belt-drive systems include a belt that is both elastic and viscous material, allowing for it to absorb some motor vibration. Direct-drive systems power the motion of the turntable with the turning of the motor, so the two operate simultaneously. Digital systems can be incorporated into one of the other two systems. Speed and volume controls, as well as digital displays, are characteristic of this type of system. Record players can be either automatic, manual, or semi-automatic. Manual players are reminiscent of the earliest turntable models. The user must place the player’s needle onto and lift it from the record manually. Automatic models are more advanced; the motions are completed with the push of a button. Semi-automatic options are a mix of the two, with the needle needing to be positioned on the record by hand, but automatically taken off once the song is complete. 2-speed and 3-speed describe the ability of a turntable to play different types of records. 2-speed record players can support 33 ⅓ RPM and 45 RPM records. 3-speed record players can accommodate those two speeds as well as another speed of 78 RPM, which is needed to play records made over half a century ago. Modern record players often include the capability to convert the audio projected by the machine into digital format. Usually, through the use of an included USB port, the music from your records is recorded and can be enjoyed on other platforms. Considering the leading-edge technology available today, this is an excellent feature for the contemporary listener. Record players in today’s times either include an internal sound system or the capability to connect to an external sound system. Turntables with an internal sound system project audio through built-in speakers or stereos. This is exceptionally convenient, but may not always produce the best quality of sound. Models which connect to external audio devices are often ideal for professional DJs, as it allows for the use of advanced and powerful amplifiers, stereos, or speakers. These products can also be optimal for those with top-notch personal sound systems. Consider your personal needs to determine which type of turntable will be right for you. The AT-LP60-USB is an affordable option from Audio-Technica’s selection of professional-grade products. While it includes fewer features compared to Audio-Technica’s more expensive options, the excellent levels of quality and durability remain the same. The LP60 is a fully automatic, belt-drive, 2-speed turntable with a die-cast aluminum platter for crisp, clear audio. Weighing just 6.61 pounds, this model is highly portable. The audio setup of this product involves an included switchable phono line preamplifier, which allows for simple connection to external powered speakers and audio systems, even those without a specific turntable output. RCA output cables are included. A trademark of many Audio-Technica turntables, the LP60 is equipped with an LP-to-digital recording system, with a built-in USB output for direct connection to your computer. Also included is Audacity software, compatible with both Mac and PC computers, for heightened digital music functionality. The AT-LP60-USB offers fantastic value for money. This model is a great choice for those who value Audio-Technica’s respected reputation, but do not have the budget for the brand’s most advanced models or do not need the magnitude of technical features they offer. Especially attractive elements of the LP60-USB are the recording feature and digital music capability. Other models in the same price bracket do not offer the benefit of included Audacity software. Also, this product’s ability to connect to audio systems, even those without set turntable outputs, offers considerable versatility and convenience. Additionally, weighing just under seven pounds, the size of this Audio-Technica bestseller is very manageable. The LP60-USB is a superb product, but will not be ideal for certain consumers. This turntable only supports two speeds. If you own vintage records which need a 78 RPM-supportive turntable, this product is not for you. Also, if you do not own external speakers, stereos, or amplifiers, you will want to find a turntable with an internal sound system. The LP60-USB requires external audio devices. The LP60-USB is an affordable product backed by the trusted and highly-regarded Audio-Technica name. If you are looking for advanced technology, a high-caliber system, and a sleek design, the AT-LP60-USB may be one of the best vinyl record players for you.